The British Campaign in France. IV. 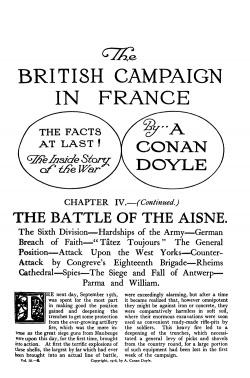 The Battle of the Aisne (continued) is the 5th article, published in august 1916, in a series of 21 articles written by Arthur Conan Doyle serialized in The Strand Magazine. 3.1.3 German Breach of Faith. 3.1.6 Attack Upon the West Yorks. 3.1.7 Counter-Attack by Congreve's Eighteenth Brigade. 3.1.10 The Siege and Fall of Antwerp. 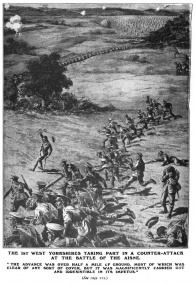 The 1st West Yorkshires taking part in a counter-attack at the battle of the Aisne. 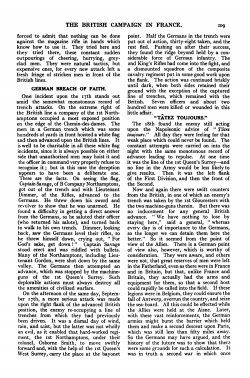 German breach of faith: the abuse of the white flag. An incident showing how a company of the 1st Northamptons were cut down through German treachery. 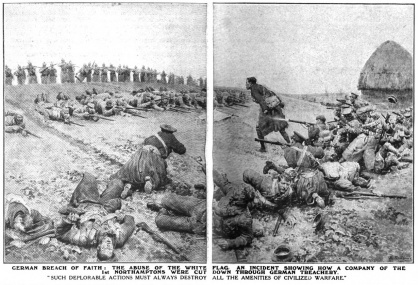 The scene of the fighting described in the present chapter. 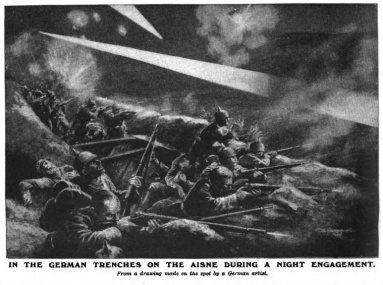 In the German trenches on the Aisne during a night engagement. Antwerp in flames during the bombardment by the Germans. The Sixth Division — Hardships of the Army — German Breach of Faith — "Tatez Toujours" — The General Position — Attack Upon the West Yorks — Counter-Attack by Congreve's Eighteenth Brigade — Rheims Cathedral — Spies — The Siege and Fall of Antwerp — Parma and William. The next day, September 15th, was spent for the most part in making good the position gained and deepening the trenches to get some protection from the ever-growing artillery fire, which was the more intense as the great siege guns from Maubeuge were upon this day, for the first time, brought into action. At first the terrific explosions of these shells, the largest by far which had ever been brought into an actual line of battle, were exceedingly alarming, but after a time it became realized that, however omnipotent they might be against iron or concrete, they were comparatively harmless in soft soil, where their enormous excavations were soon used as convenient ready-made rifle-pits by the soldiers. This heavy fire led to a deepening of the trenches, which necessitated a general levy of picks and shovels from the country round, for a large portion of such equipment had been lost in the first week of the campaign. Only two active movements were made in the course of the day, one being that Hamilton's Third Division advanced once more towards Aizy and established itself a mile or more to the north in a better tactical position. The Seventh Brigade suffered considerable casualties in this change, including Colonel Hasted, of the 1st Wilts. The other was that Ferguson's Fifth Division fell back from Chivres, where it was exposed to a cross fire, and made its lines along the river bank, whence the Germans were never able to drive it, although they were only four hundred yards away in a position which was high above it. For the rest, it was a day of navvy's toil, though the men worked alternately with rifle and with pick. for there were continual German advances which withered away before the volleys which greeted them. By the 16th the position was fairly secure, and on the same day a welcome reinforcement arrived in the shape of the Sixth Division, forming the missing half of Pulteney's Third Corps. DIVISION VI. — Gen. Keir. 16th Infantry Brigade — Gen. Ing. Williams. 17th Infantry Brigade — Gen. Walter Doran. 18th Infantry Brigade — Gen. Congreve. 2nd Notts and Derby (Sherwood Foresters). II. Brig. 21,	42,	53. XII. " 43,	86,	87. XXIV. " 110,	111,	112. XXXVIII. " 24,	34,	72. This division was kept in reserve upon the south side of the river. The French Commander-in-Chief had intimated that he intended to throw in reinforcements upon the left of the Sixth French Army, and so, as he hoped, to turn the German right. It was determined, therefore, that there should be no attempt at a British advance, but that the Allies should be content with holding the enemy to his positions. The two armies lay facing each other, therefore, at an average distance of about five hundred yards. 'I he pressure was still most severe upon the Second Brigade on the extreme right. Bulfin's orders were to hold on at all costs, as he was the pivot of the whole line. He and his men responded nobly to the responsibility, although both they and their neighbours of Maxse's First Brigade had sustained a loss of over a thousand men each upon the 14th — twenty-five per cent. of their number. The shell-fire was incessant and from several converging directions. German infantry attack were constant by night and by day, and the undrained trenches were deep in water. The men lay without overcoats and drenched to the skin, for the rain was incessant. Yet the sixth day found them on the exact ground upon which they had thrown their weary bodies after their attack. Nations desire from time to time to be reassured as to their own virility. Neither in endurance nor in courage have the British departed from the traditions of their ancestors. The unending strain of the trenches reached the limits of human resistance. But the line was always held. 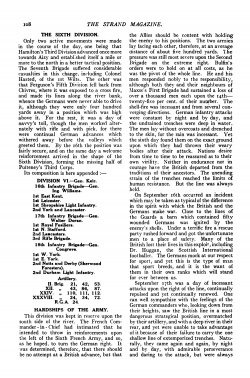 On September 16th occurred an incident which may be taken as typical of the difference in the spirit with which the British and the Germans make war. Close to the lines of the Guards a barn which contained fifty wounded Germans was ignited by the enemy's shells. Under a terrific fire a rescue party rushed forward and got the unfortunate men to a place of safety. Many of the British lost their lives in this exploit, including Dr. Huggan, the Scottish International footballer. The Germans mock at our respect for sport, and yet this is the type of man that sport breeds, and it is the want of them in their own ranks which will stand for ever between us. September 17th was a day of incessant attacks upon the right of the line, continually repulsed and yet continually renewed. 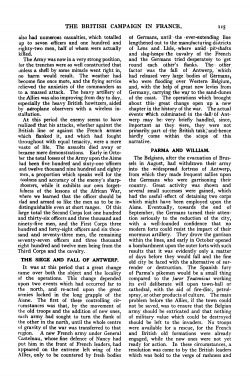 One can well sympathize with the feelings of the German commanders who, looking down from their heights, saw the British line in a most dangerous strategical position, overmatched by their artillery, and with a deep river in their rear, and yet were unable to take advantage of it because of their failure to carry the one shallow line of extemporized trenches. Naturally, they came again and again, by night and by day, with admirable perseverance and daring to the attack, but were always forced to admit that nothing can be done against the magazine rifle in hands which know how to use it. They tried here and they tried there, these constant sudden outpourings of cheering, hurrying, grey-clad men. They were natural tactics, but expensive ones, for every new attack left a fresh fringe of stricken men in front of the British lines. One incident upon the 17th stands out amid the somewhat monotonous record of trench attacks. On the extreme right of the British line a company of the 1st Northamptons occupied a most exposed position on the edge of the Chemin-des-dames. The men in a German trench which was some hundreds of yards in front hoisted a white flag and then advanced upon the British lines. It is well to be charitable in all these white flag incidents, since it is always possible on either side that unauthorized men may hoist it and the officer in command very properly refuse to recognize it ; but in this case the deception appears to have been a deliberate one. These are the facts. 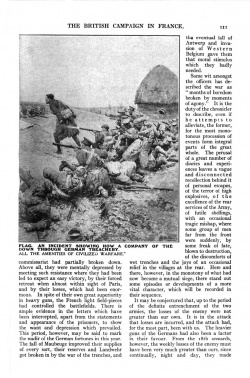 On seeing the flag, Captain Savage, of B Company Northamptons, got out of the trench and with Lieutenant Dimmer, of the Rifles, advanced to the Germans. He threw down his sword and revolver to show that he was unarmed. He found a difficulty in getting a direct answer from the Germans, so he saluted their officer (who returned his salute), and turned back to walk to his own trench. Dimmer, looking back, saw the Germans level their rifles, so he threw himself down, crying out, " For God's sake, get down ! " Captain Savage stood erect and was riddled with bullets. Many of the Northamptons, including Lieu-tenant Gordon, were shot down by the same volley. 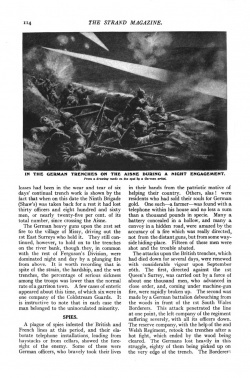 The Germans then attempted an advance, which was stopped by the machine-guns of the 1st Queen's Surrey. Such deplorable actions must always destroy all the amenities of civilized warfare. On the afternoon of the same day, September 17th, a more serious attack was made upon the right flank of the advanced British position, the enemy re-occupying a line of trenches from which they had previously been driven. It was a dismal day of wind, rain, and mist, but the latter was not wholly an evil, as it enabled that hard-worked regiment, the 1st Northamptons, under their colonel, Osborne Smith, to move swiftly forward and, with the help of the 1st Queen's West Surrey, carry the place at the bayonet point. Half the Germans in the trench were put out of action, thirty-eight taken, and the rest fled. Pushing on after their success, they found the ridge beyond held by a considerable force of German infantry. The 2nd King's Rifles had come into the fight, and a dismounted squadron of the composite cavalry regiment put in some good work upon the flank. 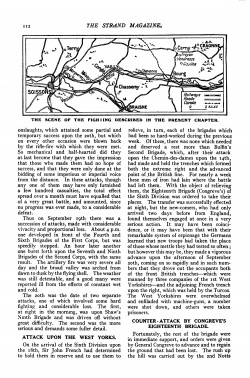 The action was continued briskly until dark, when both sides retained their ground with the exception of the captured line of trenches, which remained with the British. Seven officers and about two hundred men were killed or wounded in this little affair. The 18th found the enemy still acting upon the Napoleonic advice of "Tâtez toujours." All day they were feeling for that weak place which could never be found. The constant attempts were carried on into the night with the same monotonous record of advance leading to repulse. At one time it was the line of the 1st Queen's Surrey — and no line in the Army would be less likely to give results. Then it was the left flank of the First Division, and then the front of the Second. Now and again there were swift counters from the British, in one of which an enemy's trench was taken by the 1st Gloucesters with the two machine-guns therein. But there was no inducement for any general British advance. "We have nothing to lose by staying here," said a general, "whereas every day is of importance to the Germans, so the longer we can detain them here the better." So it seemed from the point of view of the Allies. There is a German point of view also, however, which is worthy of consideration. They were aware, and others were not, that great reserves of men were left in the Fatherland, even as there were in France and in Britain, but that, unlike France and Britain, they actually had the arms and equipment for them, so that a second host could rapidly be called into the field. If these legions were in Belgium, they could ensure the fall of Antwerp, overrun the country, and seize the sea-board. All this could be effected while the Allies were held at the Aisne. Later, with these vast reinforcements, the German armies might burst the barrier which held them and make a second descent upon Paris, which was still less than fifty miles away. So the Germans may have argued, and the history of the future was to show that there were some grounds for such a calculation. It was in-truth a second war in which once again the Germans had the men and material ready, while the Allies had not. This date, September 18th, may be taken as the conclusion of the actual Battle of the Aisne, since from that time the operations defined themselves definitely as a mutual siege and gigantic artillery duel. 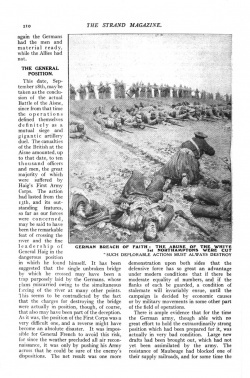 The casualties of the British at the Aisne amounted, up to that date, to ten thousand officers and men, the great majority of which were suffered by Haig's First Army Corps. 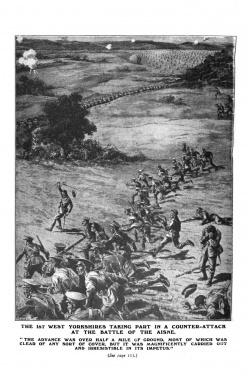 The action had lasted from the 13th, and its outstanding features, so far as our forces were concerned, may be said to have been the remarkable feat of crossing the river and the fine leadership of General Haig in the dangerous position in which he found himself. It has been suggested that the single unbroken bridge by which he crossed may have been a trap purposely laid by the Germans, whose Mans miscarried owing to the simultaneous forcing of the river at many other points. This seems to be contradicted by the fact that the charges for destroying the bridge were actually in position, though, of course, that also may have been part of the deception. As it was, the position of the First Corps was a very difficult one, and a reverse might have become an absolute disaster. It was impossible for General French to avoid this risk, for since the weather precluded all air reconnaissance, it was only by pushing his Army across that he could be sure of the enemy's dispositions. The net result was one more demonstration upon both sides that the defensive force has so great an advantage under modern conditions that if there be moderate equality of numbers, and if the flanks of each he guarded, a condition of stalemate will invariably ensue, until the campaign is decided by economic causes or by military movements in some other part of the field of operations. There is ample evidence that for the time the German army, though able with no great effort to hold the extraordinarily strong position which had been prepared for it, was actually in very bad condition. Large new drafts had been brought out, which had not yet been assimilated by the army. The resistance of Maubeuge had blocked one of their supply railroads, and for some time the commissariat had partially broken down. Above all, they were mentally depressed by meeting such resistance where they had been led to expect an easy victory, by their forced retreat when almost within sight of Paris, and by their losses, which had been enormous. In spite of their own great superiority in heavy guns, the French light field-pieces had controlled the battlefields. There is ample evidence in the letters which have been intercepted, apart from the statements and appearance of the prisoners, to show the want and depression which prevailed. This period, however, may be said to mark the nadir of the German fortunes in this year. The fall of Maubeuge improved their supplies of every sort, their reserves and Landwehr got broken in by the war of the trenches, and the eventual fall of Antwerp and invasion of Western Belgium gave them that moral stimulus which they badly needed. Some wit amongst the officers has described the war as "months of boredom broken by moments of agony." It is the duty of the chronicler to describe, even if he attempts to alleviate, the former, for the most monotonous procession of events form integral parts of the great whole. 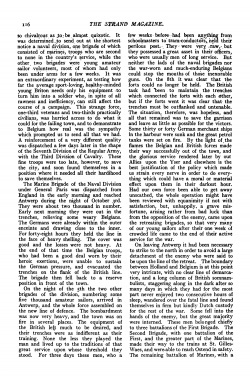 The perusal of a great number of diaries and experiences leaves a vague and disconnected recollection behind it of personal escapes, of the terror of high explosives, of the excellence of the rear services of the Army, of futile spellings, with an occasional tragic mishap, where some group of men far from the front were suddenly, by some freak of fate, blown to destruction, of the discomforts of wet trenches and the joys of an occasional relief in the villages at the rear. Here and there, however, in the monotony of what had now become a mutual siege, there stand out some episodes or developments of a more vital character, which will be recorded in their sequence. It may be conjectured that, up to the period of the definite entrenchment of the two armies, the losses of the enemy were not greater than our own, It is in the attack that losses are incurred, and the attack had, for the most part, been with us. The heavier guns of the Germans had also been a factor in their favour. From the 18th onwards, however, the weekly losses of the enemy must have been very much greater than ours, since continually, night and day, they made onslaughts, which attained some partial and temporary success upon the 20th, but which on every other occasion were blown back by the rifle-fire with which they were met. So mechanical and half-hearted did they at. last become that they gave the impression that those who made them had no hope of success, and that they were only done at the bidding of some imperious or imperial voice from the distance. In these attacks, though any one of them may have only furnished a few hundred casualties, the total effect spread over a month must have equalled that of a very great battle, and amounted, since no progress was ever made, to a considerable defeat. Thus on September 19th there was a succession of attacks, made with considerable vivacity and proportional loss. About 4 p.m. one developed in front of the Fourth and Sixth Brigades of the First Corps, but was speedily stopped. An hour later another one burst forth upon the Seventh and Ninth Brigades of the Second Corps, with the same result. The artillery fire was very severe all day and the broad valley was arched from dawn to dusk by the flying shell. The weather was still detestable, and a good many were reported ill from the effects of constant wet and cold. The 20th was the date of two separate attacks, one of which involved some hard fighting and considerable loss. The first, at eight in the morning, was upon Shaw's Ninth Brigade and was driven off without great difficulty. The second was the more serious and demands some fuller detail. Attack Upon the West Yorks. On the arrival of the Sixth Division upon the 18th, Sir John French had determined to hold them in reserve and to use them to relieve, in turn, each of the brigades which had been so hard-worked during the previous week. Of these, there was none which needed and deserved a rest more than Bulfin's Second Brigade, which, after their attack upon the Chemin-des-dames upon the 14th, had made and held the trenches which formed both the extreme right and the advanced point of The British line. For nearly a week these men of iron had lain where the battle had left them. With the object of relieving them, the Eighteenth Brigade (Congreve's) of the Sixth Division was ordered to take their places. The transfer was successfully effected at night, but the new-corners, who had only arrived two days before from England, found themselves engaged at once in a very serious action. It may have been coincidence, or it may have been that with their remarkable system of espionage the Germans learned that new troops had taken the place of those whose mettle they had tested so often ; but however this may be, they made a vigorous advance upon the afternoon of September 20th, coming on so rapidly and in such numbers that they drove out the occupants both of the front British trenches — which were manned by three companies of the 1st West Yorkshires — and the adjoining French trench upon the right, which was held by the Turcos. The West Yorkshires were overwhelmed and enfiladed with machine-guns, a number were shot down, and others were taken prisoners. Counter-Attack by Congreve's Eighteenth Brigade. Fortunately, the rest of the brigade were in immediate support, and orders were given by General Congreve to advance and to regain the ground that had been lost. The rush up the hill was carried out by the 2nd Notts and Derby Regiment (Sherwood Foresters) in the centre, with the remainder of the West Yorks upon their right, and the 2nd Durham Light Infantry upon their left. They were supported by the 1st East Yorks and by the 2nd Sussex Regiment, which had just been called out of the line for a rest. The 4th Irish Dragoon Guards at a gallop at first, and then dismounting with rifle and bayonet, were in the forefront of the fray. The advance was over half a mile of ground, most of which was clear of any sort of cower, but it was magnificently carried out and irresistible in its impetus. All the regiments lost heavily, but all reached their goal. Officers were hit again and again, but staggered on with their men. Captain Popham, of the Sherwood Foresters, is said to have carried six wounds with him up the slope. Fifteen officers and two hundred and fifty men were shot down, but the lost trench was carried at the point of the bayonet and the whole position re-established. The total casualties were thirteen hundred and sixty-four, more than half of which fell upon the West Yorkshires, while the majority of the others were Sherwood Foresters, East Yorkshires, and Durhams. Major Robb, of the latter regiment, was among those who fell. The Germans did not hold the trenches for an hour, and yet the engagement may be counted as a success for them, since our losses were certainly heavier than theirs. There was no gain, however, in ground. The action was more than a mere local attack, and the British line was in danger of being broken had it not been for the determined counter-attack of the Eighteenth Brigade. To the north of this main attack there was another subsidiary movement on the Beaulne ridge, in which the Fifth and Sixth Brigades were sharply engaged. The 1st King's, the 2nd H.L.I., and the 2nd Worcesters all sustained some losses. About this period, both the British and the French armies began to strengthen themselves with those heavy guns in which they had been so completely overweighted by their enemy. On the 20th the French in the neighbourhood of our lines received twelve long-range cannon, firing a thirty-five-pound shell a distance of twelve kilometres. Three days later the British opened fire with four new batteries of six-inch howitzers. From this time onwards there was no such great disparity in the heavy artillery, and the wounded from the monster shells of the enemy had at least the slight solace that their fate was not unavenged. The expenditure of shells, however, was still at the rate of ten German to one of the Allies. If the war was not won it was no fault of Krupp and the men of Essen. In two weeks the British lost nearly three thousand men from .,hell-fire. It was at this time, September 20th, that the Germans put a climax upon the long series of outrages and vandalisms of which their troops had been guilty by the deliberate bombardment of Rheims Cathedral, the Westminster Abbey of France. The act seems to have sprung from deliberate malice, for though it was asserted afterwards that the tower had, been used as an artillery observation point, this is in the highest degree improbable, since the summit of the ridge upon the French side is available for such a purpose. 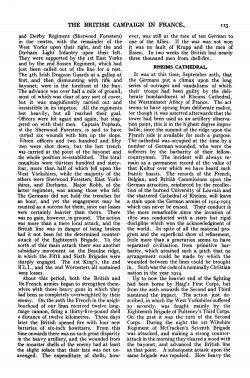 The cathedral was occupied at the time by a number of German wounded, who were the sufferers by the barbarity of their fellow-countrymen. The incident will always remain as a permanent record of the value of that Kultur over which we have heard such frantic boasts. The records of the French, Belgian, and British Commissions upon the German atrocities, reinforced by the recollection of the burned University of Louvain and the shattered Cathedral of Rheims, will leave a stain upon the German armies of 1914-1915 which can never be erased. Their conduct is the more remarkable since the invasion of 1870 was conducted with a stern but rigid discipline which won the acknowledgment of the world. In spite of all the material progress and the superficial show of refinement, little more than a generation seems to have separated civilization from primitive barbarity, which attained such a pitch that no arrangement could be made by which the wounded between the lines could be brought in. Such was the code of a nominally Christian nation in, the year 1914. Up to now the heavier end of the fighting had been borne by Haig's First Corps, but from the 20th onwards the Second and Third sustained the impact. The action just described, in which the West Yorkshires suffered so severely, was fought mainly by the Eighteenth Brigade of Pulteney's Third Corps. On the 21st it was the turn of the Second Corps. During the night the 1st Wiltshire Regiment of McCracken's Seventh Brigade was attacked, and making a strong counter-attack in the morning they cleared a wood with the bayonet, and advanced the British line at that point. A subsequent attack upon the same brigade was repulsed. How heavy the losses had been in the wear and tear of six days' continual trench work is shown by the fact that when on this date the Ninth Brigade (Shaw's) was taken back for a rest it had lost thirty officers and eight hundred and sixty men, or nearly twenty-five per cent. of its total number, since crossing the Aisne. The German heavy guns upon the 21st set fire to the village of Missy, driving out the 1st East Surreys who held it. They still continued, however, to hold on to the trenches on the river bank, though they, in common with the rest of Ferguson's Division, were dominated night and day by a plunging fire from above. It is worth recording that in spite of the strain, the hardship, and the wet trenches, the percentage of serious sickness among the troops was lower than the normal rate of a garrison town. A few cases of enteric appeared about this time, of which six were in one company of the Coldstream Guards. It is instructive to note that in each case the man belonged to the uninoculated minority. A plague of spies infested the British and French lines at this period, and their elaborate telephone installations, leading from haystacks or from cellars, showed the fore-sight of the enemy. Some of these were German officers, who bravely took their lives in their hands from the patriotic motive of helping their country. Others, alas ! were residents who had sold their souls for German gold. One such — a farmer — was found with a telephone within his house and no less a sum than a thousand pounds in specie. Many a battery concealed in a hollow, and many a convoy in a hidden road, were amazed by the accuracy of a fire which was really directed, not from the distant guns, but from some wayside hiding-place. Fifteen of these men were shot and the trouble abated. The attacks upon the British trenches, which had died down for several days, were renewed with considerable vigour upon September 26th. The first, directed against the 1st Queen's Surrey, was carried out by a force of about one thousand men, who advanced in close order, and, coming under machine-gun fire, were rapidly broken up. The second was made by a German battalion debauching from the woods in front of the 1st South Wales Borderers. This attack penetrated the line at one point, the left company of the regiment suffering severely, with all its officers down. The reserve company, with the help of the 2nd Welsh Regiment, retook the trenches after a hot fight, which ended by the wood being cleared. The Germans lost heavily in this struggle, eighty of them being picked up on the very edge of the trench. The Borderers also had numerous casualties, which totalled up to seven officers and one hundred and eighty-two men, half of whom were actually killed. The Army was now in a very strong position for the trenches were so well constructed that unless a shell by some miracle went right in, no harm would result. The weather had become fine once mote, and the flying service relieved the anxieties of the commanders as to a massed attack. The heavy artillery of the Allies was also improving from day to day, especially the heavy British howitzers, aided by aeroplane observers with a wireless installation. At this period the enemy seems to have realized that his attacks, whether against the British line or against the French armies which flanked it, and which had fought throughout with equal tenacity, were a mere waste of life. The assaults died away or became mere demonstrations. Early in October the total losses of the Army upon the Aisne had been five hundred and sixty-one officers and twelve thousand nine hundred and eighty men, a proportion which speaks well for the coolness and accuracy of the enemy's sharp-shooters, while it exhibits our own forget-fulness of the lessons of the African War, where we learned that the officer should be clad and armed so like the men as to be indistinguishable even at short ranges. Of this large total the Second Corps lost one hundred and thirty-six officers and three thousand and ninety-five men, and the First Corps three hundred and forty-eight officers and six thousand and seventy-three men, the remaining seventy-seven officers and three thousand eight hundred and twelve men being from the Third Corps and the cavalry. The Siege and Fall of Antwerp. It was at this period that a great change came over both the object and the locality of the operations. This change depended upon two events which had occurred far to the north, and re-acted upon the great armies locked in the long grapple of the Aisne. The first of these controlling circumstances was that, by the movement of the old troops and the addition of new ones, each army had sought to turn the flank of the other in the north, until the whole centre of gravity of the war was transferred to that region. A new French army under General Castelnau, whose fine defence of Nancy had put him in the front of French leaders, had appeared on the extreme left wing of the Allies, only to be countered by fresh bodies of Germans, until the ever-extending line lengthened out to the manufacturing districts of Lens and Lisle, where amid pit-shafts and slag-heaps the cavalry of the French and the Germans tried desperately to get round each other's flanks. The other factor was the fall of Antwerp, which had released very large bodies of Germans, Who were flooding over Western Belgium, and, with the help of great new levies from Germany, carrying the war to the sand-dunes of the coast. The operations which brought about this great change open up a new chapter in the history of the war. The actual events which culminated in the fall, of Antwerp may be very briefly handled, since, important as they were, they were not primarily part of the British task, and hence hardly come within the scope of this narrative. The Belgians after the evacuation of Brussels in August, had withdrawn their army into the widespread fortress of Antwerp, from which they made frequent sallies upon the Germans who were garrisoning their country. Great activity was shown and several small successes were gained, which had the useful effect of detaining two corps which might have been employed upon the Aisne. Eventually, towards the end of September, the Germans turned their attention seriously to the reduction of the city, with a well-founded confidence that no modern forts could resist the impact of their enormous artillery. They drove the garrison within the lines, and early in October opened a bombardment upon the outer forts with such results that it was evidently only a matter of days before they would fall and the fine old city be faced with the alternative of surrender or destruction. The Spanish fury of Parma's pikemen would be a small thing compared to the furor Teutonicus working its evil deliberate will upon town-hall or cathedral, with the aid of fire-disc, petrol-spray, or other products of culture. The main problem before the Allies, if the town could not be saved, was to ensure that the Belgian army should be extricated and that nothing of military value which could be destroyed should be left to the invaders. No troops were available for a rescue, for the French and British old formations were already engaged, while the new ones were not yet ready for action. In these circumstances, a resolution was come to by the British leaders which was bold to the verge of rashness and so chivalrous as to be almost quixotic. It was determined to send out at the shortest notice a naval division, one brigade of which consisted of marines, troops who are second to none in the country's service, while the other, two brigades were young amateur sailor volunteers, most of whom had only been under arms for a few weeks. It was an extraordinary experiment, as testing how far the average sport-loving, healthy-minded young Briton needs only his equipment to turn him into a soldier who, in spite of all rawness and inefficiency, can still affect the course of a campaign. This strange force, one-third veterans and two-thirds practically civilians, was hurried across to do what it could for the failing town, and to demonstrate to Belgium how real was the sympathy which prompted us to send all that we had. A reinforcement of a very different quality was dispatched a few days later in the shape of the Seventh Division of the Regular Army, with the Third Division of Cavalry. These fine troops were too late, however, to save the city, and soon found themselves in a position where it needed all their hardihood to save themselves. The Marine Brigade of the Naval Division under General Paris was dispatched from England in the early morning and reached Antwerp during the night of October 3rd. They were about two thousand in number. Early next morning they were out in the trenches, relieving some weary Belgians. The Germans were already within the outer enceinte and drawing close to the inner. For forty-eight hours they held the line in the face of heavy shelling. The cover was good and the losses were not heavy. At the end of that time the Belgian troops, who had been a good deal worn by their heroic exertions, were unable to sustain the German pressure, and evacuated the trenches on the flank of the British line. The brigade then fell back to a reserve position in front of the town. On the night of the 5th the two other brigades of the division, numbering some five thousand amateur sailors, arrived in Antwerp, and the whole force assembled on the new line of defence. 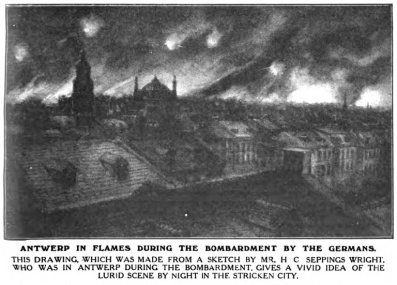 The bombardment was now very heavy, and the town was on fire in several places. The equipment of the British left much to be desired, and their trenches were as indifferent as their training. None the less they played the man and lived up to the traditions of that great service upon whose threshold they stood. For three days these men, who a few weeks before had been anything from schoolmasters to tram-conductors, held their perilous post. They were very raw, but they possessed a great asset in their officers, who were usually men of long service. But neither the lads of the naval brigades nor the war-worn and much-enduring Belgians could stop the mouths of those inexorable guns. On the 8th it was clear that the forts could no longer be held. The British task had been to maintain the trenches which connected the forts with each other, but if the forts went it was clear that the trenches must be outflanked and untenable. The situation, therefore, was hopeless, and all that remained was to save the garrison and leave as little as possible for the victors. Some thirty or forty German merchant ships in the harbour were sunk and the great petrol tanks were set on fire. 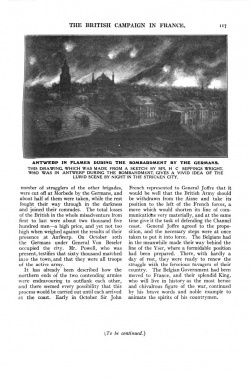 By the light of the flames the Belgian and British forces made their way successfully out of the town, and the glorious service rendered later by our Allies upon the Yser and elsewhere is the best justification of the policy which made us strain every nerve in order to do everything which could have a moral or material effect upon them in their darkest hour. Had our own force been able to get away unscathed, the whole operation might have been reviewed with equanimity if not with satisfaction, but, unhappily, a grave misfortune, arising rather from bad luck than from the opposition of the enemy, came upon the retreating brigades, so that very many of our young sailors after their one week of crowded life came to the end of their active service for the war. On leaving Antwerp it had been necessary to strike to the north in order to avoid a large detachment of the enemy who were said to be upon the line of the retreat. The boundary between Holland and Belgium is at this point very intricate, with no clear line of demarcation, and a long column of British somnambulists, staggering along in the dark after so many days in which they had for the most part never enjoyed two consecutive hours of sleep, wandered over the fatal line and found themselves in firm but kindly Dutch custody for the rest of the war. Some fell into the hands of the enemy, but the great majority were interned. These men belonged chiefly to three battalions of the First Brigade. The Second Brigade, with one battalion of the First, and the greater part of the Marines, made their way to the trains at St. Gilles-Waes, and were able to reach Ostend in safety. The remaining battalion of Marines, with a number of stragglers of the other brigades, were cut off at Morbede by the Germans, and about half of them were taken, while the rest fought their way through in the darkness and joined their comrades. The total losses of the British in the whole misadventure from first to last were about two thousand five hundred men — a high price, and yet not too high when weighed against the results of their presence at Antwerp. On October 10th the Germans under General Von Beseler occupied the city. Mr. Powell, who was present, testifies that sixty thousand marched into the town, and that they were all troops of the active army. It has already been described how the northern ends of the two contending armies were endeavouring to outflank each other, and there seemed every possibility that this process would be carried out until each arrived at the coast. Early in October Sir John French represented to General Joffre that it would he well that the British Army should be withdrawn from the Aisne and take its position to the left of the French forces, a move which would shorten its line of communications very materially, and at the same time give it the task of defending the Channel coast. General Joffre agreed to the proposition, and the necessary steps were at once taken to put it into force. The Belgians had in the meanwhile made their way behind the line of the Yser, where a formidable position had been prepared, There, with hardly a day of rest, they were ready to renew the struggle with the ferocious ravagers of their country. The Belgian Government had been moved to France, and their splendid King, who will five in history as the most heroic and chivalrous figure of the war, continued by his brave words and noble example to animate the spirits of his countrymen. This page was last edited on 10 March 2018, at 16:18.